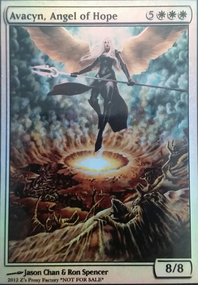 Does Grand Abolisher stop activation of Archangel of Tithes? Ezuri parte molto veloce con una serie di drop a 1 e 2. Anche Trostani è rapidissimo e scendono in tavola prima Anointed Procession e poi Crested Sunmare . Al 4° o 5° turno Arcades è già costretto a lanciare Fell the Mighty per pulire il tavolo e rallentare il gioco, di fatto inchiodando gli elfi con una carta in mano. Zur si mette in protezione con Propaganda , Windborn Muse e Archangel of Tithes e diventa praticamente inattaccabile. Trostani, diventato archenemy e con 50+ life, inizia a popolare cavalli ma viene fermato in tempo da Imprisoned in the Moon . Arrivano in tavola anche Armada Wurm e Collective Blessing per Trostani, e Arcades viene vaporizzato da un attacco in massa di token. Zur nel frattempo ha tutorato Shielded by Faith e Curator's Ward senza che gli altri potessero opporsi. Prende anche Ethereal Armor e il turno seguente Phyresis e subito dopo Arcades lascia il gioco anche Trostani che non ha volanti per opporsi. Nel frattempo Ezuri si è ripreso e ha un po' di creature in gioco. Appena Zur passa prova a chiudere subito la partita con Coat of Arms e Triumph of the Hordes ma si becca un Cyclonic Rift in faccia. Tocca di nuovo a Zur e finisce lì. 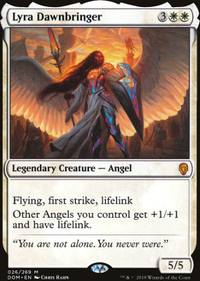 What if you templated it like Archangel of Tithes , where your opponents only have to pay the life if he's untapped? That means you're at least having to choose between offense and defense. It also rewards you for building around him by including things to give him vigilance, or untappers, or the like. Perhaps you could include a buff when he attacks too, although I'd definitely up the mana cost to at least six if you choose to do that. Also, creature type Sylvanesti? No. I get that that's supposed to be a bloodline (if I'm interpreting it right), but that's not a creature type. Reserve that kind of thing for flavor text, where you can do more with it anyway. Also, consider giving him a job - creature types are usually templated as (Kind of creature)(Role that creature plays), like for example on Soulfire Grand Master , it's a human and a monk. The most common pairings with "Vampire" are Knight (23/227) and Soldier (21/227), followed not too far behind by Warrior (17) then Shaman (16) then Cleric (14), with Wizard chilling at a surprisingly low 10/227. That said, I was surprised to see how many vampires actually don't have jobs - 87 of 227 printed Vampires are unemployed. Apparently, vampires are leeches on society as well as... you know. People. Ok quick update, it didn't take me long to realize that the Resplendent Angel doesn't bring much to the game plan. 1x Lyra Dawnbringer out of 2 -> a 4th Thalia's Lancers . It's been quite some time now that I'm often wishing to draw my tutors more. 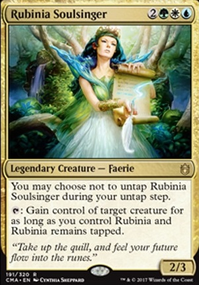 I also learned today that since Ixalan, all planeswalkers are now legendary and do not work with the "planeswalker's uniqueness" rule like they used to. So this means I can tutor my Gideons with the Lancers! Yay! So more Lancers. 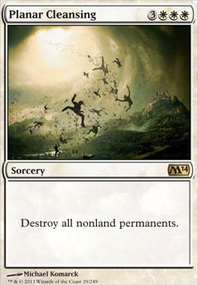 And I'm cutting a Lyra because I don't need her so much given that I have fewer angels overall, and if I really need one Lyra on board I still have 5 ways to get her in the deck. a 4th Runed Halo in. 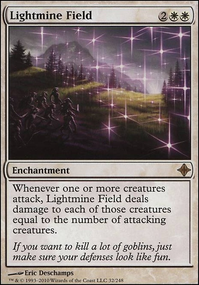 This card is too good, provides big amounts of devotion early on that is a pain for my opponent to remove, forces them to flood the board with even more creatures only to get sweeped... It's really good, there are tons of games where drawing it is critical, and they are almost 0 game where I can't benefit from it. 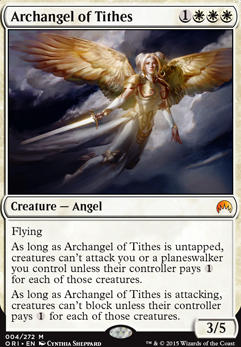 Is a 4th Archangel of Tithes viable? Or is it too much? My local meta is quite aggro like I said so keep in mind that this matters too. Runed Halo . Should I put 2? 3? 4? Learning to play with it and learning the threats to target. So far I really like it! Resplendent Angel . Alright this one I'm the least sure about. On the one hand it's a 3/3 with fly and 2W devotion for 3mana, and I really like the pressure it puts on some decks when you can pull the combo with Lyra and Seraph Sanctuary (which given the redundancy of the deck happens more often than you would think), and it is great to put all my wasted mana in late game. 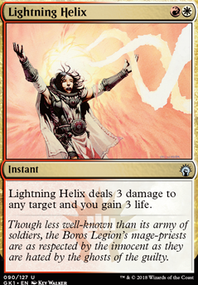 But on the other hand, it just dies to bolt, doesn't provide control like an Archangel of Tithes would. It also goes a bit against the Wrath of God (which I wouldn't mind putting a 4th of), and makes games faster which removes a bit the purpose of Emeria . I'm not sure that given the overall rhythm of the deck it isn't either a bit useless or a winmore... I will have to test this more in depth. 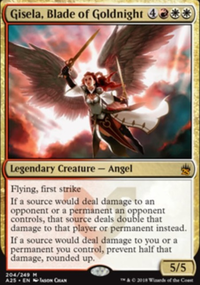 If you have any idea of 2-3cmc control permanents I could try to use instead of the Resplendent Angels I welcome every suggestion! I used to play Oblivion Ring , and it kinda worked so maybe I could try that but it also did feel a bit clunky, so looking for anything that you could think of!